Habitat: The white tube worm colonies form large, dense bands between 0.3 and 0.6 metres wide, at the mid tide level, usually in crevices and rocky outlets with a dominant current. It is seen as an indicator organism with distinct zonation on the rocky shore. With such large numbers this species is responsible for filtering large volumes of sea water each day. Ecology: This worm’s tube is made up of calcium carbonate. Whilst the main part of the worm lives in its calcareous tube, the feeding part, consisting of large retractable flowering tentacles, comes out when covered by the tide. When immersed in water they use this flowering head to filter feed. Because of the mesh like web, of the filter feeding head, these worms can catch plankton for food. The spiralled and branched head tentacles used for feeding are also used as a breathing organ. 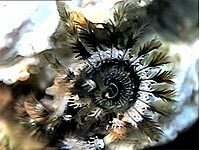 The white tube worm protects itself from dehydration by sealing itself in the tube with an ornate plug called the operculum. Not only does it protect the worm in this way but the lid appears to resemble a crab’s face, perhaps as a defence warning to other interested predators. The strength of the tubes is another protective measure to protect the worm from wave action. 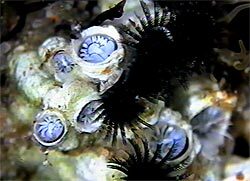 The sexes of the white tube worm are separate and as with the brown tube worm they undergo external fertilisation involving synchronous spawning with specific phases of the moon and tide. The fertilised eggs hatch into planktonic larvae for a short period. They then settle on bare and suitable substrate where they construct their tubes by extracting calcium carbonate from the ocean. 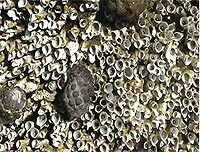 Their main predator is the Mulberry oyster borer.